A rusk with a long history behind it… It is a Protected Geographical Indication product and the product that opened the way and established the use of rusks in general as a part of everyday nutrition. From 1948 until today, our family continues to produce it in exactly the same way. We knead and shape it with our hands before baking it on stone in a wood oven, a distinctive unique process that gives it special flavour and exquisite aromas. Barley rusks have even been recommended for pharmaceutical use because of the multiple healing properties of the fibre they contain. Some of the benefits of fibre include its action against constipation and haemorrhoids, inhibiting the growth of pathogenic microorganisms in the intestine, and its contribution to the prevention of serious diseases in the colon. Combined with a balanced diet low in calories, it helps to reduce body weight, because it increases the levels of saturation and feeling full. It also contributes to the elimination of cholesterol and the maintenance of stable levels of glucose in the blood. Because it is a whole grain product containing whole grain barley, it is richer in minerals and trace elements than a simple wheat product or a simple whole grain product. 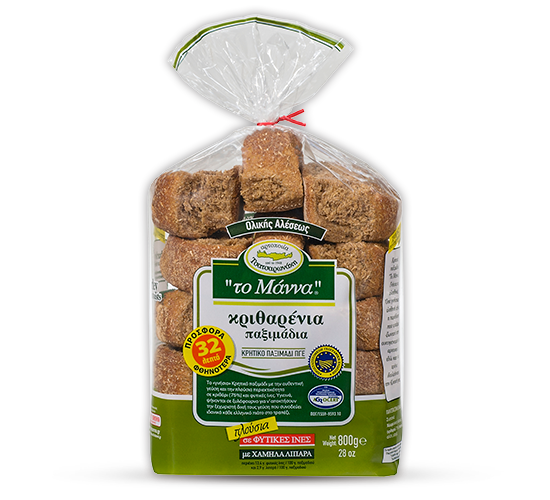 In the package, you will find large rusks with an extremely tough and crisp texture, and an almost irregular shape as the rusks are hand cut. It is ideal both as an accompaniment and as a main meal, and is a sufficient meal when garnished with fresh tomato, olive oil, feta or myzithra cheese, oregano, olives or whatever else you want. It can be eaten dry or wet. Place it under running water at normal temperature for a few seconds (5” is enough) so that the rusk softens but is not spoiled and doesn’t lose any of its crispness – this distinctive feature is due to the large amount of insoluble plant fibre it contains, such as large ground bran pieces, which absorbs 3 times its weight in water.